Afterlives was originally intended to be a series written collaboratively between several authors. I started off with what I thought was an interesting premise, something that could be expanded upon by other creative minds, and then left it open for elaboration. Unfortunately, no one ever took me up on that offer, and I ended up writing several more stories that fit together into a single, rough storyline. 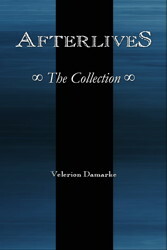 The end result was Afterlives: The Collection. I don't do a lot of horror, but this dark fantasy was as close to it as I get. All eight short stories about Gage, the Soul Collector, and his companions have been collected into this single volume. Travel with Gage in a world full of angels, demons, and strange powers as he tries to put dark, vengeful souls at rest, fighting demons and other dark creatures to do it. A man named Gage has a difficult job. It is his lot in life is to send trapped souls on to the afterlife, and to do it he has to take them into his body and carry out their last wishes. He leaves a safe haven where he can take a break from his purpose to rescue a boy with whom he feels some affinity when he demonstrates a potential for similar powers. The boy has had his tongue cut out by his parent's murderers, but he seems to trust Gage. Gage and the tongueless boy named Josiah hunts down the boy's parent's killers. The leader seems unnaturally powerful though, and may prove to be too much for Gage. Gage is recovering from his last fight with his new companion Josiah, when a storm comes upon them in their shelter. The storm brings with it a disturbing thing, that being a type of worm called a Graverobber worm. These are a signal of ill omen, and they lead Gage and his tongueless companion out to search for the place that has caused the earth to send these worms out to warn him. They find a horrible scene of carnage and a number of souls bent on using him for revenge against the cult that killed them. Gage, Josiah, and Yonah flee from the temple of the Blood Cult, and make their way west, presumably to safety. Rains come heavy, and they are forced to cross a raging river during the worst of the storms. Josiah displays some affinities to water that Gage can't explain, and the village they're staying in seems strangely devoid of souls needing help. Gage follows a hunch and investigates a strange variety of local arachnid. The arachnids lure them into their forest before springing a trap on them, but they seem to be following someone's orders, someone with a dark power that may be beyond what Gage and his companions can deal with. Gage, Josiah, and Yonah recover in another wolde. Gage tries to train Josiah, but finds his powers rather different from his own. He also gives Yonah another chance to leave and seek a life on her own. Eventually, the peace is ended, when Gage feels taint on the wind, and the trio leaves to investigate. What they find is stronger and stranger than anything they've seen yet, and Josiah is captured. Gage and his companions travel south to determine the source of a great evil he senses. They begin to cross the great continental dividing range and into the Southlands where he feels the great evil growing. A demon seeks to bar their way into the lands beyond the mountains though, and begins a deadly game of cat and mouse with Gage and his companions. Gage and his companions venture into the Southlands where the red-skinned city builders reign. Gage meets a fellow countryman where he least expects it and the man offers his help. The evil among the Southlanders has become an everyday thing, and no one notices anymore. Jeslyn leads them southward toward the Father of Nothing, who is in charge of the web of souls that spans the greater part of the Southlands. They detour to an oasis of sorts in the plains where they find another mystery and an intelligent pack of coyotes. Then they press onward to Uxnali where their fate lies in wait for them. Gage and his companions endure captivity at the hands of the Father of Nothing. The Father of Nothing seems amused and pleased to torture them by digging through their minds and making them relive their most painful moments. They try what they can, but resisting is nearly impossible. Jeslyn seems to have her own agenda, and the power of Creation seem to have a hand in things too. A climactic fight is upon them all. Be sure to check out Afterlives merchandise on cafepress!